Is your Goal that Every Student is College and Career Ready? Since 2009, Santa Barbara City College has collaborated with the Carpinteria and Santa Barbara School Districts to deliver a successful Dual Enrollment Freshman Transition (DEFT) course for freshman. Today the 10-year Plan, developed in this course, is a graduation requirement for the Santa Barbara high schools. It was determined that to most effectively impact student success, yearly structured updates to each student’s online 10-year plans were desirable. 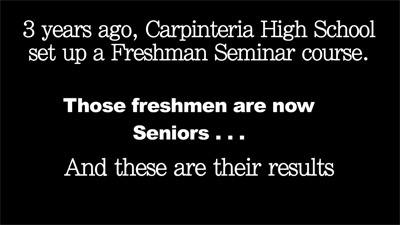 In 2012, the 10th 11th and 12th grade efforts began. This past fall, the first cohort to graduate brought their 10-year plans to SBCC to be used for academic coaching and counseling to inform student education plans (SEPS) and help students stay on track for timely completion of either an AA degree, certificate or transfer to a university.